There's a lot you can learn about PTC software in two hours or less! Note: This article was originally posted in my personal blog here on PTC Community, but as we are in full planning mode for PTC Live Global in June where we offer 2-hour training sessions, too, I thought it would be a good idea to repost it here! 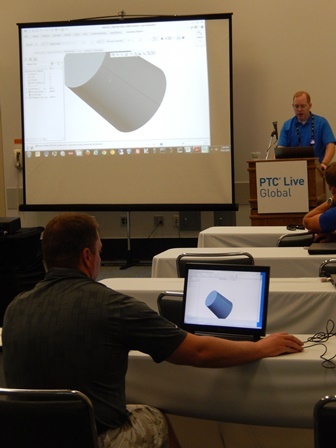 Have you ever attended a training session at one of our PTC Live events? If so, I hope you found the information valuable and plan to attend future sessions. If not, let me give you a quick overview of what is available to you. At PTC Live Global, PTC Live Stuttgart and the PTC Live Tech Forum events that we run globally each year, PTC University offers two-hour training sessions to the attendees at no cost. Can you really learn much in such a short time? And can you really expect formal training when the session is entirely free? In other words, what is the value of these sessions? Each session is an excerpt of our standard curriculum, focusing on a clearly defined topic to fit the two-hour timeframe. You will get a solid introduction and receive valuable tips and tricks. Each session is presented by one of our experienced instructors and subject-matter-experts. The sessions are not sales demos; they are real classes. Like any instructor-led class, you will be able to ask questions of the instructor and the rest of the class participants. If you have evaluated a training class in the past, but weren’t sure what to expect, you should hurry to sign up for your first classroom experience at the next PTC event near you. You take a trial before you purchase software, so why not try training before you book a full two-day or three-day class? Many of these two-hour sessions that we offer at events are focused on the latest versions of our software. If you are evaluating an update of your PTC software to a newer version, these sessions are a great way to get a true, hands-on experience. See what the interface is like and learn tips and tricks that will make adoption of the new version even easier. Now you might ask, where can I take one of these training sessions? Check out the event site for local details. Check out the official event page of the user group! Last but not least: PTC Live Global 2014 in Boston! Our 25th anniversary event has many training options waiting for you. I personally look forward to meeting many of you at our events, and I hope you will sign up for a free training session at your next PTC event.